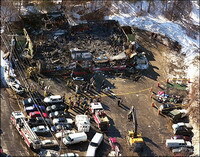 Several defendants in a 2003 Rhode Island nightclub fire case have tentatively agreed to a $13.5 million (9.9 million EUR) settlement. The settlements, if approved by a judge, would be the first in what the plaintiffs hope will be several agreements with dozens of defendants in the lawsuits stemming from the Feb. 20, 2003, fire at the Station nightclub in West Warwick during a show by rock band Great White. The fire also injured 200 people. "It's just the beginning," said Michael St. Pierre, one of the attorneys representing nearly 300 fire survivors and victims' relatives who have sued in federal court. The fire began when pyrotechnics for Great White ignited flammable sound-absorbing foam around the stage and the club's walls. The foam quickly spread the blaze throughout the one-story roadhouse. Among the companies that have tentatively agreed to settle are a manufacturers of soundproofing material, a manufacturer and vendor of pyrotechnics that ignited the blaze, the company that leased the building to club owners Jeffrey and Michael Derderian, and an alarm company, according to court papers. Dave Kane, father of 18-year-old Nicholas O'Neill, the youngest fire victim, said families still want accountability for the fire beyond any financial settlement. But, he added, the money would be useful to people whose lives were damaged. "There are so many people that are really desperate for this - out of necessity now, not greed," he said. John Barylick, an attorney for the families, said the settlement is dependent on the court appointing a special master to oversee the distribution of the money. "There is certainly agreement among the parties to settle, but it's dependent on clearing some legal hurdles," Barylick said. The lawyers are recommending that Francis McGovern, a law professor at Duke University, serve as special master. They say he has fulfilled similar duties in more than 50 cases, including litigation over silicone breast implants and DDT pesticide exposure. McGovern did not immediately respond to a call seeking comment. Word of the potential settlement came hours before the state parole board was to hear from victims' families about a possible early release from prison for Daniel Biechele, the former tour manager for Great White. Biechele is eligible for parole later this month. James Murphy, a lawyer for Triton Realty Limited Partnership, which leased the building to the club owners, said his clients "were personally traumatized by the fire, not just the loss of the building but the fact that people had died in the building that they had owned. "Regardless of the lack of liability, they wanted to get this behind them," Murphy said. Plaintiffs say one of the companies who has agreed to settle in principle, Celotex Corp., manufactured a soundproofing board that was placed above the drummer's alcove. A lawyer for Celotex did not immediately comment. Two other defendants included in the possible settlement are pyrotechnic maker Luna Tech Inc. and pyrotechnic vendor High Tech Special Effects Inc.
A lawyer for Luna Tech refused to comment, while a lawyer for High Tech did not return calls seeking comment. The Derderians and Biechele were convicted last year of 100 counts each of involuntary manslaughter. Jeffrey Derderian was sentenced to 500 hours of community service, and his brother and Biechele were sentenced to serve four years in prison.